Work with visitors of all ages to share a love of art. Harn Museum docents are volunteer tour guides who lead visitors in engaging discussions about museum collections and exhibitions. 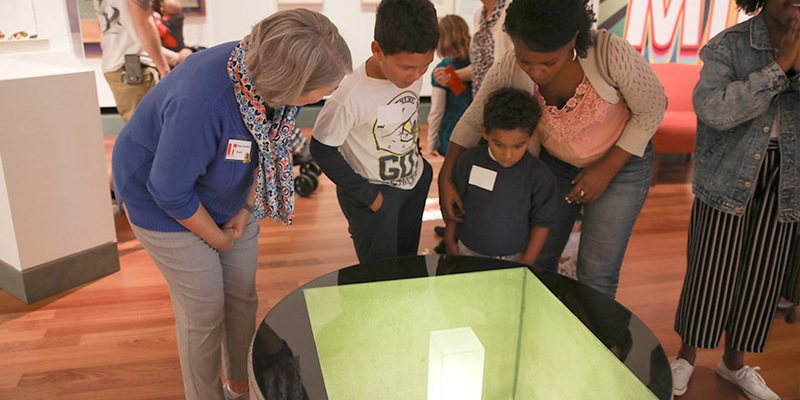 Through mindful study of art interpretation and touring strategies, docents create open, welcoming and enjoyable experiences for our diverse and multigenerational audiences. Docents make many of our public programs possible, including School Tours, Family Days, Tot Time and Senior Outreach. Docents participate in 1 - 2 training sessions per month on an ongoing basis and are required to give at least 20 tours per year. Because of the substantial time and study required of Harn docents, we ask for long-term commitment of at least three years. Those interested in becoming a Harn docent must submit an application, be accepted and complete a comprehensive New Docent Training Program. Prior art experience is not required as training and mentoring is provided through a series of active, fun and engaging sessions. The 2019 New Docent Training Program is underway. We are no longer accepting applications at this time. To express interest and receive information about the next New Docent Training Program, contact Elizabeth King at eking@harn.ufl.edu or 352.294.7061.